Buildings typically have only one structural system and associated R-factor in each principal axis and vertically. However, in cases where more than one R-factor system is utilized horizontally or vertically, special rules of ASCE 7 apply. In general, design forces and limitations associated with the lower R-factor system are applicable for design in the direction of each principal axis under consideration. There are three common exceptions worthy of mention. Vertical combinations: Where a building transitions from one system to another vertically through the height of the building structure, system height limits are imposed for the entire structure based on the most restrictive system used. When the upper portion of the structure has a larger R-factor, the upper portion is permitted to be designed for the R-factor associated with that system. The forces imposed from the upper portion onto the lower portion are required to be multiplied (increased) by the ratio of R-factors. 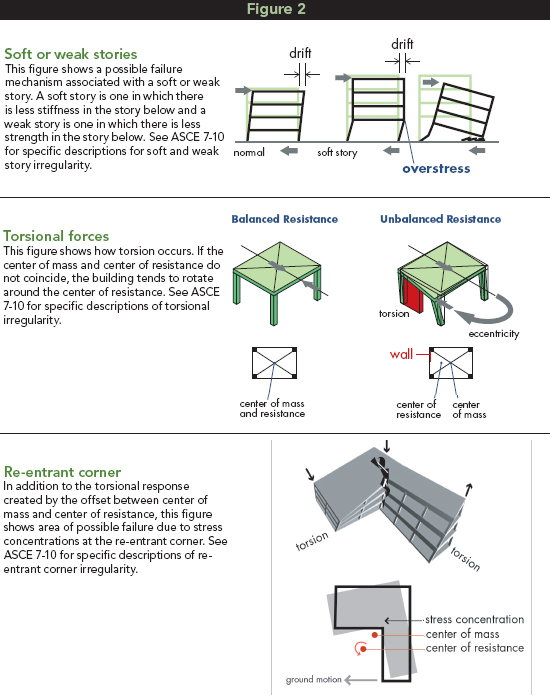 Horizontal combinations: For one- or two-story Risk Category I or II buildings of light-frame or flexible diaphragm construction, the lowest R-factor in any independent line of resistance may be utilized as long as the diaphragm is designed for the lowest R-factor in the overall direction. Two-stage analysis procedure: This procedure applies when the upper portion of a structure is relatively flexible compared to a rigid lower portion. In this case, the interface between the upper and lower portions is considered to be the base of the upper structure from which structural height of the upper portion is measured. For these structures, the overall building height equals the structural height for the upper portion added to the height of the lower portion. The most common application of the two-stage analysis procedure for wood-frame construction utilizes an upper portion constructed of wood-frame wood structural panel shear walls (structural height limited to 65 ft maximum above the top of the lower portion in SDC D, E, and F) constructed on top of a Type IA concrete podium. ▶ The lower structure must be at least 10 times as stiff as the upper structure. ▶ The period of the entire structure shall not be greater than 1.1 times the period of the upper portion considered as a separate structure supported at the transition from the upper to the lower portion. ▶ The upper portion shall be designed as a separate structure using the appropriate values of R and ρ. ▶ The lower portion shall be designed as a separate structure using the appropriate values of R and ρ. The reactions from the upper portion shall be those determined from the analysis of the upper portion amplified by the ratio of the R/ρ of the upper portion over R/ρ of the lower portion. This ratio shall not be less than 1.0. ▶ The upper portion is analyzed with the equivalent lateral force or modal response spectrum procedure, and the lower portion is analyzed with the equivalent lateral force procedure. Examples of structural irregularities from FEMA 424 – Design Guide for Improving School Safety in Earthquakes, Floods and High Winds. Another good reference is FEMA 454 – Designing for Earthquakes – a Manual for Architects. In SDC D, E, and F, the two-stage procedure can be used over a 20-ft-high Type IA podium allowing the overall building construction height of up to 85 ft maximum prescribed in the height and area provisions of the IBC. In addition, to allow the design to structurally achieve height limits associated with height and area provisions, the two-stage procedure allows the upper portion to have the maximum permitted number of stories and area while being considered a separate structure for IBC height and area purposes (with the overall building height measured from the ground).